Hopper’s pictures “deal with America not only on the surface, but dig deep into the American dream, radically examining this profoundly American dilemma of appearances and reality,” says the German film maker Wim Wenders, who refers to the great American painter Edward Hopper (1882–1967) in his work like many other artists from Alfred Hitchcock and David Hockney to Paul Auster and Peter Handke. Hardly any twentieth-century artist has succeeded in combining existential artistic claims with an aesthetics that describes everyday life, the individual moment, and the iconography of a place in such a poetical and impressive manner. Regardless of the art fashions of his day, Hopper developed a metarealism transforming the subjective perception of reality into something universal, reflecting the isolation of modern urban man, and exploring new forms of visual narration. The representation and manipulation of space, time, light, and shadow are the essential ingredients guaranteeing Hopper’s unbroken topicality in art. His reduced, psychologically charged, and meticulously constructed spaces unfold a lasting tension between the real and the fictitious, specific moments and duration, intimacy and anonymity, nature and civilization. From Ed Ruscha’s stereotype condensations of the American myth and Rachel Whiteread’s and David Claerbout’s investigations of space-time coordinates to the homelessness of present-day existence as mirrored in Philip-Lorca diCorcia’s and Tim Eitel’s work, Hopper’s oeuvre finds its echo in the exhibition’s contemporary positions. 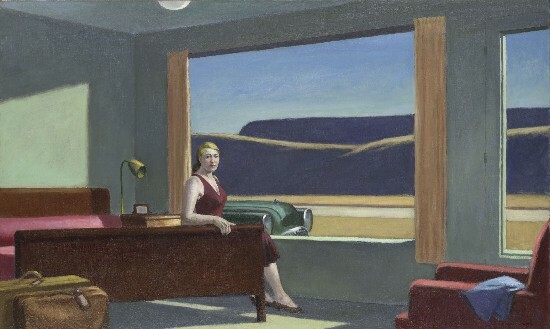 Hopper’s works continue to describe the state of today’s world, his cinematographic view providing the starting point for narrative inventions and imaginations in space and time.